Rep. Kevin McCarthy shares his weekly post with BakersfieldObserved. If you have any thoughts or feedback, post a comment. Here's Kevin. 'As I mentioned at the end of last week, Congress will not be in session during August and I will be back in California with a full schedule focusing on small businesses and listening to constituent views on the national health care reform debate. * August 25-Bakersfield Small Business Forum, (Bakersfield Downtown Marriott) for anyone interested in starting a small business or current owners who are looking expand and improve, to RSVP, send an email to: RSVP.McCarthy@mail.house.gov or call my office: 327-3611. * August 26-Health Care Town Hall Meeting (Bakersfield City Council Chambers) to discuss the ongoing health care reform proposals in Congress, to RSVP, send an email to: RSVP.McCarthy@mail.house.gov or visit my website: www.kevinmccarthy.house.gov or call my office at: 327-3611. 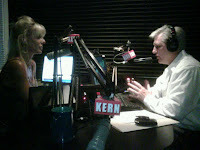 On Tuesday, I hosted the Ralph Bailey show and my daughter Meghan joined me. Most of the show focused on the ongoing health care reform debate, along with the Cash for Clunkers program, my guests included Congressman and Doctor, Michael Burgess (TX), Congressman Kevin Brady (TX), and none other than our very own local Bakersfield Californian columnist, Lois Henry. We also talked with local Bakersfield resident and Hollywood actor Charles Napier about his new comedy, “The Goods: Live Hard, Sell Hard,” which tells the story of a group of salesmen charged with saving a car dealership on the verge of bankruptcy. Next up was recent Congressional intern, Megan Duggan, from Tehachapi. She told us about her intern experience this summer working in our DC and Bakersfield offices – she did a great job for us. Our final guest was California Congressman Darrell Issa. Darrell is the Senior Republican on the House Committee on Oversight and Government Reform. He was all over the news last Friday as he issued a warning to the Administration to not intimidate Members of Congress who are asking legitimate questions on the effectiveness of Speaker Pelosi’s $1 trillion stimulus as the nation’s unemployment continues to remain at above 9%. "Wednesday, I returned to the Ralph Bailey show, this time as a guest of Lois Henry who was filling in for Ralph. We talked about the continuing need for transparency in regard to how current fees are being collected and spent by the U.S. Forest Service. We both agreed that before there are any new proposals of additional fees, the public needs to know how current funding is being used. I also announced that I had joined the Western Congressional Caucus and I will continue to work with other Members of Congress from western states to focus on public lands issues. From a big picture perspective, transparency is needed across the Federal government; we need to know how money is being spent before we spend more, and this goes for all areas, as we have seen more than one spending bill rushed through Congress this year without the chance of needed scrutiny. We also discussed the man-made water crisis in our state. I continue to work with my colleagues in the Central Valley to support legislation and find solutions to this crisis. "Wednesday and Thursday evening I held tele-town hall meetings, using new technology to call around 30,000 households each night in Bakersfield. The topic of both meetings was health care reform. I also was able to take a simple poll from those who were listening and participating. I asked them to press # 1 if they supported the Democrat proposal and to press # 2 if they did not support the plan. 96% of those on the call the first night did not support the Democrat plan and 4% did. The second night yielded similar results, with 89% opposing and 11% in favor. "Next week I plan to hold another tele-town hall meeting, again on the topic of health care reform, and this time I will be talking to San Luis Obispo County residents. August 25, my office will host a Small Business Forum in Bakersfield for anyone interested in starting a small business or anyone who currently owns and operates one. We will have local and Federal agency representatives there to answer questions and give support to our local small business owners. As a former small business owner myself, I understand the challenges facing small businesses, and I believe that Congress should be focusing on issues that will help these businesses and create jobs, and not impose additional expensive government mandates such as cap and trade or government-run health care. As California continues to tackle double-digit unemployment, and knowing that small business provide our nation with over 70% of our jobs, I want to make sure constituents of the 22nd District are provided with the tools and resources they need to succeed. In early September, my office will hold another Small Business Forum in San Luis Obispo County. c'mon, Richard....stop being a shill for McCarthy. He's a great guy and all, but don't let your blog morph into a mouthpiece for Kevin. I'm curious as to how the numbers are chosen to participate in the tele-town hall. The poll results are very lopsided even for this area. I can comment on how people were selected for last week's event, because I got a robo-call at home inviting me to participate. Not sure if it is because I am a registered voter, or simply because my number came up (it can't be because I'm a registered Republican). I chose not to participate. Why? (1) Because it was 6PM and I was in the middle of making dinner. (2) I did not have time to participate in a "meeting." Want my opinion? Then ask me a few questions and I will be on my way. But if you want me to attend a meeting, whether on the phone or in person, then give me some advance notice. (3) Mr. McC's events are partisan, which is to be expected because, well, he is a partisan. If he really wanted to hear what people feel, rather than setting up an echo chamber, how about a joint town hall meeting hosted by him and Jim Costa, the guy who represents the other part of Bakersfield in the House? Also, it is not unexpected to get the "poll" responses he reported. Just look at the way the questions were worded: he asked participants whether "they supported the Democrat (sic) proposal." What was missing was the chance to express opinions on the Republican proposal. Which is what, exactly? Lastly, I noted your response to a previous post that you'd "rather hear what they all have to say." Me, too. But I haven't seen anything in your blog from anyone else, just Mr. McC. I respect that this is your personal blog, but may I kindly suggest that if you want to hear what "they all" have to say, I say bring the "others" in so we can, too. I continue to enjoy your blog, Mr. Beene, and recognize the time and effort involved for you to do so. Thank you.